Over the past little while, some thoughts have been brewing in my mind and it is time to put these thoughts into a post. I am a huge sports fan. I am in my mid thirties now, and have been avidly following sports for pretty much all of these years. I know the agony I feel when my favorite team loses, or is eliminated from “championship” contention. I am VERY familiar with this. I am an avid Boston Bruins fan – they had a couple of Stanley Cup runs, but didn’t ever hoist the trophy. I like the Charlotte now New Orleans Hornets, – again no titles. I was a fan of the Montreal Expos – no titles there. Then when they moved, so did my allegience to my 2nd favorite team for years – the Boston Red Sox. They’ve won a couple World Series titles in the past decade and I was a long suffering the New Orleans Saints fan, (for about 20 years) before they won Super Bowl 44) I am still in shock about that one. Now of course, passion and excitement goes beyond Championships and wins. It sits with the identity we take in our favorite teams. You know what I mean – the schedule comes out and you start looking over the games, deciding which ones “we” are likely to win. And as a result of that identification, we occasionally carry our passion too far. I have been following the story of Bryan Stow, a SF Giants fan who was attacked by some Dodger fans on opening day. He was very seriously hurt. The story continued 2 weeks later when the teams met again, this time in SF, and the security forces were out, to discourage and prepare for any attempts to retaliate. The players on the Dodgers and Giants also spoke to fans, reminding them that being a supportive fan is great, but there needs to be some civility and responsibility to act with a certain level of dignity and restraint. 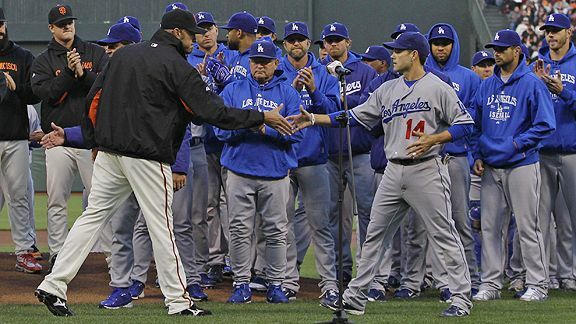 Jeremy Affeldt – a Giants reliever, and Jamey Carrol, a Dodgers infielder, were the frontliners from each team at this rally. You can read an excellent account of all that was going on behind the scenes and in the mind of Jeremy Affeldt by checking out his blog here. I’ve written about his blog on here before, read it often, friends, he says a lot of great, challenging stuff. One thing that didn’t sit well with me about the whole issue is that going to cheer on the visiting team should be a relatively safe experience. I know that this is a pretty isolated incident, but I do remember feeling a little nervous when I went to attend my first ever NFL game in 1997. It was at Soldier Field in Chicago, where divisional rival Detroit Lions and their star running back Barry Sanders were in town. He was my favorite player at the time, and so, without giving it much thought, I put on my Sanders jersey and went to the game. Well did I ever hear about it! Passing the tailgaters, and other fans on the way into the Stadium itself and even at our seats, during the game. There were many things said to me, mostly in fun, but some were pointed, violent or vulgar. After the game, I admit, that I was a lilttle fearful as we returned to our vehicle (Barry had a great day, (160+yds and 2 or 3 TD’s and a Lions Victory). Although I never sensed any real danger, I got a lot of attention, if given the chance to do it again, I might reconsider my wardrobe. Here is the thing that I notice. We get so passionate, so immersed in our team that if we are not careful, things like our mood, our interaction with others, our social activities can all be influenced by how our team is doing. We get so passionate when we express our love for our favorite team. Are we that passionate when we express our love for the God that created us? At the end of the day, what’s more important cheering on our team, or acknowleging the plan that God created us for? Things to think about, for me at least, as I continue to enjoy sports, but keep them in in their proper perspective. How cool is this. I just posted a blog entry a couple of days ago about Baseball chapel, and here they are again getting a mention in relation to Easter services for Major League teams. They also extend these Chapel services beyond baseball (Nascar is mentioned as is Golf). Torii Hunter of the LA Angels talks about how he very, very rarely misses these services and former Royals manager, and current Dodgers coach Trey Hillman mentions taking the model to Japan when he managed there for a few years. Again, I think this is a cool organization that is truly being “the church” and providing opportunities for faith-building, encouragement, accountability and an opportunity to meet the creator of the world on a regular basis, or for the very first time. Read the whole article by clicking on the link below. Happy Easter to you all! Baseball Chapel isn’t just an Easter Sunday service. This is part 5 in my series about Christ-following baseball players. Today, our focus takes us back out to the western divisions of both leagues with stops in Seattle and San Diego. First stop is with a player in the Seattle Mariners farm system. His name is Matt Tuiasosopo – He is a native of Washington state, drafted by his “hometown” Mariners. He is starting this season at their top minor league affiliate – the Tacoma Rainiers where he has spent parts of the last 3 years. Matt’s family are all strong Christ followers, who have come to know some success in their sports, and yet managed to do so while living out their strong faith in God and putting their relationship with Him in the forefront of the way they lead their life. Matt’s father Manu has a Super Bowl Ring (1986 San Francisco 49ers) from his NFL days. What struck me about this family though was the list of priorities that they have for their lives. Ask any of the Tuiasosopo children and you’ll get the same answer. In order of priority, their passions are faith, family, friends, school and, lastly, sports. Click here to read an article about the family. They understand that making it to the top of your chosen sport is nice. But to live this life looking with hope toward eternity that lies ahead is the best. That is where the relationship you have with God and the impact that relationship will have on others will be evident. This story is about a family that, despite being raised amid professional sports, have managed to get their priorities straight. What a great lesson. They understand the importance of a relationship with God and want to impact the lives of those around them. The second story that I have for you today is about the San Diego Padres. Heath Bell is the Padres closer, the one who “saves” the game. This story talks about an important save that happened a couple of years ago in his life. That is when he and his wife decided to choose to follow Christ with their life. He is a new believer, and I’ve often wondered, with the travel involved, as well as the celebrity, how possible is it for new believers in baseball circles, or other sports, to grow in their faith and understanding of God? The baseball season stretches from April to October, which is half of the calendar year. Sundays are days of the week that often seen every major league team in action. That means that for half of the year, there isn’t an opportunity to go to church or be part of an community of believers in a faith-building environment. I came across a great organization that saw this need and decided to meet the need. Baseball Chapel is an organization that has taken on the responsibility of offering chapel services to all major and most minor league teams. They offer Sunday chapel services to anyone who is interested in attentding. Most of the time, they offer 3 separate services – one for each team and one for the umpires. How important is this ministry?! It gives a chance for community and faith building, encouragement, bible study, and spiritual growth. If you want more information about this ministry, click the photo to the left. And to see one of the baseball chapel staff in action and the players support of this organization, click this link and read the article from Sharing the Victory which talks about Heath Bell, as well as Adrian Gonzalez (now with my beloved Red Sox), Chase Headley, and Nick Hundley. I know that I for one will be praying for this ministry as it seeks to pour into these athletes and encourage them in their faith. As I mentioned earlier, Heath Bell is a new believer, and to know that there is an organization that is there to teach, disciple and encourage new believers like him shows that pro sports is a mission field and God’s people are going into the world and making these disciples. Keep up the great work Baseball chapel! Just as I was entering the theater to watch Soul Surfer with my 5th/6th grade youth group (Club 56) I read a tweet from a Greg Stier, president of “Dare 2 Share” Ministries. His take on the movie was that it was refreshing to go to a movie that was not only “good – you know, for a Christian movie” but actually a good movie overall. I agree with that take. It has been great to see that over the last decade or so, there is no step down in quality from “good music” to “Christian music”. Christian Movies have not progressed as quickly, but there is hope. I’m not going to tell you that it was the best movie that I have ever seen and deserves to be remembered at Oscar time, but there are a lot of movies that come to theaters that are not necessarily Oscar worthy. It is easy, however to find enjoyable, well-done movies. That is where I put this one too. It was an enjoyable story, uplifting and full of lessons to learn about depending on God, persevering through hard times, getting some perspective that life that doesn’t revolve around you, and trusting God to bring good in situations that seem to have no good in them. It was pretty well acted, the Hawaiian scenery was BEAUTIFUL, and the story engaging. Time well spent with Club 56 and worth the time and money to go see. Now that I am familiar with the story, it is great to see how Bethany Hamilton has dealt with the loss of her arm, struggled to understand why, and decided what to do about it. To see how she sees every day as an opportunity to tell others about how God is working in her and helping her live a life that honors Him. As I have learned the story, it brought to mind another story of another Christian athlete. He also suffered a grim incident. His name is Dave Dravecky. He was a star pitcher for the San Diego Padres and San Francisco Giants. He had been successful in his career. Then, in 1988, cancer had been discovered in the deltoid muscle of his throwing arm. He was told that only a miracle would allow him to pitch again. The attention of the baseball world was firmly focused on him when miraculously, he made his return to pitch for the Giants less than 18 months later. But it was short lived. In a gruesome moment, his arm broke mid-pitch during his second game back. The cancer had returned and weakened the arm. Later that year, he announced his retirement from baseball at the age of 33. His childhood dreams were over. He eventually had the arm amputated to stop cancer from spreading to the rest of his body. Since that time, he has become a speaker and author, sharing his story to many different audiences. He understands that God has given him a platform to share God’s love to others. I read his first 2 books when I was in high school, finding his story amazing and faith encouraging. For more about Dave Dravecky, check out his web-site here. There are some similarities to their stories. They have suffered agony, loss, dream-shattering reality and moments of doubt. They are also similar in that they have since accepted their responsibility to use their fame and influence to share not only their stories – which are very Christ-centered, but also to offer insight and invitation for others to trust Jesus and live life for Him. What a challenge from these 2 believers. They’ve been through more than I can imagine. Yet, they are ready to share the joy that is in their life, and point to the importance Christ plays in their lives. God’s plan always is the best, and by challenging his children to go through hard times and depend only on God for solutions, even when it is hard, uncomfortable or scary we can be sure that God is with us. We can overcome. Press on to attain the prize for which God has called us heavenward. This is part 4 in my series about Christian baseball players sharing their faith. Now, because the 2 major leagues are not balanced, there needs to be 1 week when I focus on 2 teams from the National League. This is that week. Colorado Rockies and St. Louis Cardinals step into my focus. First up we have the Colorado Rockies. Confession time… I love trivia!! I think it is cool to see the random connections that are out there. Click here and scroll down to the “personal life” part to see a really cool, random connection between Rockies OF, Seth Smith – and his Rockies Teammate Todd Helton, and the Manning brothers of NFL fame. But Christian faith runs deeper than just the players on the team. The Rockies also have yearly “Faith Days” at Coors Field. The way that these days work in baseball is after a game is played,there is a Christian music concert and a player or two will share a challenge or tell part of his faith story. There is an organization called Third Coast Sports who organize these events with various professional and minor league sports, Here is their website. The other story for the day is that of Adam Wainright, of the St. Louis Cardinals. He made a name for himself in his rookie season of 2006. He hit the first pitch he saw for a homerun – this is a rare enough feat but even moreso for a pitcher. He made the team out of spring training and became the closer when an injury ro their regular closer gave that role to him. Well, as a rookie, he wound up as the pitcher who was on the mound for the final outs of the clinching games of the National League Divisional Series, the National League Championship Series, and the World Series. He played a big role in helping the Cards win the championship. The next year, he moved into the starting rotation, where he continued to excel, even landing on a video game cover. Last year, he finished 2nd in the Cy Young Award voting, given to the best pitcher in each league. This year, he was expected to compete for the award again, and lead his team back to the playoffs. But, it was not to be. In his first batting practice throwing session, he felt discomfort in his arm. it turned out to be something serious. He had major surgery to deal with the issue which ended his season, and may delay the start of next year for him. Recovery time is generally 12-15 months. It is a major injury and brings in some light shades of doubt about whether he will return to his star form. I recently read a couple of blog posts written by Adam Wainright. He talks first on the struggle of dealing with this injury, and then on the peace that he now feels. He knows that even though it is hard, that God can ultimately bring about good from this challenge. Check it out by following this link. It is refreshing to hear firsthand about how God is using this time to challenge Adam and draw him closer. It can be hard to remember, but it is wonderful to think that God cares more about our hearts and our relationship with him then our worldly success. In the end, God’s plan is always best, and the lessons and equipping we recieve, God can use down the road. The post is in his own words and there is a challenge for us all to take. Thanks Adam for sharing from your heart about what God is doing and teaching you. Again, let me know what you think, and if you have any more cool stories that you want to share about athletes living their faith out for all to see.